Our breath hangs in the air like clouds this morning as we emerge from our tent and notice the white horse still quietly sharing our camp, munching away on grass now laced with frost. There is something almost mystical about him, something unearthly and intense and oddly human about this animal so majestically formed that he looks practically chiseled from ice-cold marble. Under the statuesque creature's soulful gaze, we pack up camp with a bittersweet melancholy tinged with anticipation and wonder; we are leaving this country that has stolen our hearts, in order to journey into the unknown. The clouds and the cold appeared overnight to play their part, adding depth to the already dramatic scene that lay before us. Car packed, we drive off feeling excited and slightly trepidatious. For a moment, I think I have a sense of how mariners of old might have felt, sailing off into the unknown with only the stars to guide them, holding the belief that they could very well sail to the edge of the world. 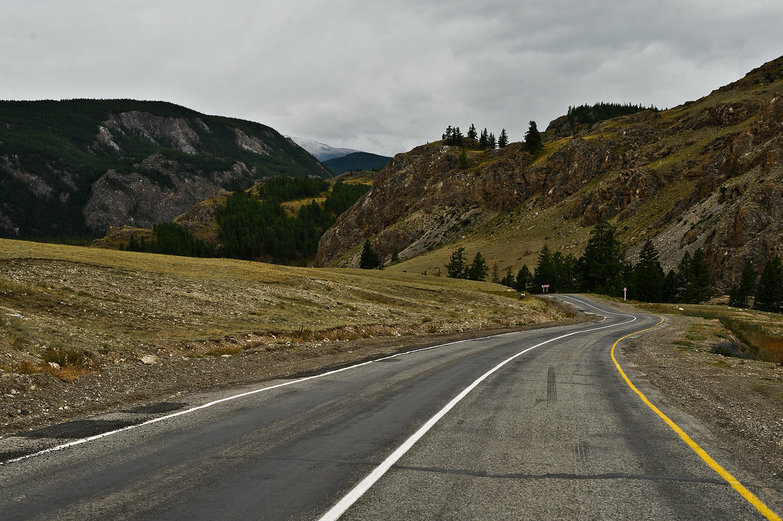 Most of our ride we are silent, soaking up every last bit of Altay's splendor. 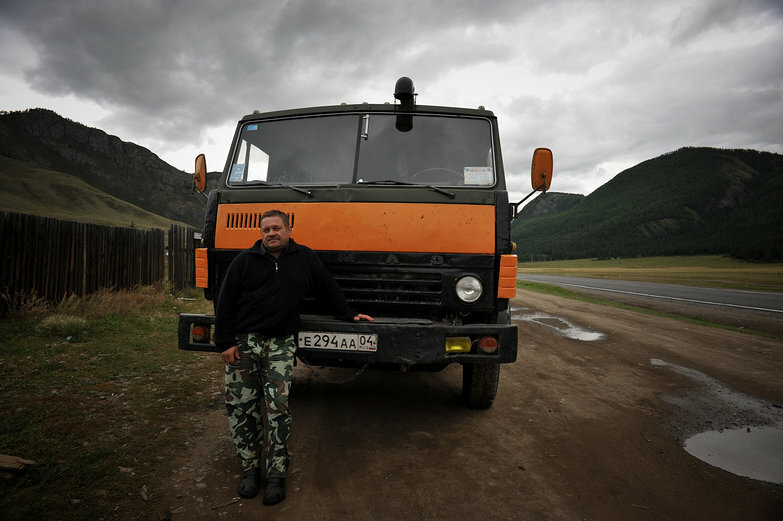 In less than a few hours, we will be at the end of the line, the edge of Russia, where our long, snaking mountain road winds its way into Mongolia. We've been through many border crossings, but this one is shrouded in the unknown. 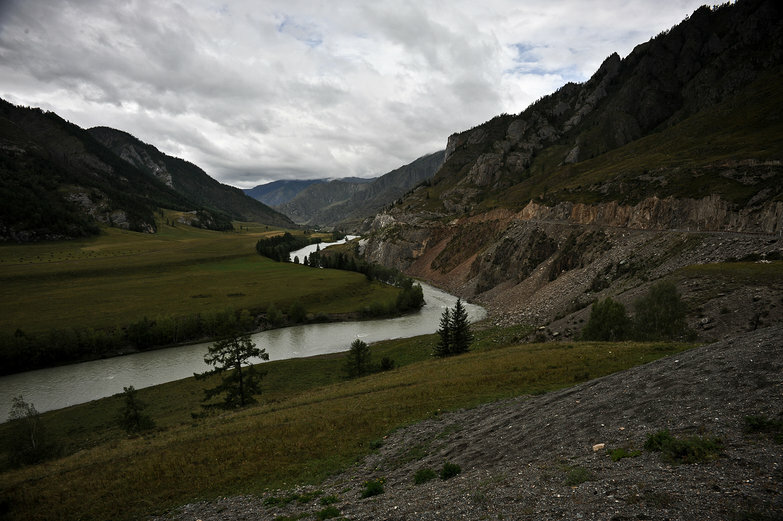 Just the word Mongolia conjures up visions of endless steppe and a hardy, nomadic people born of the mighty Genghis Khan. 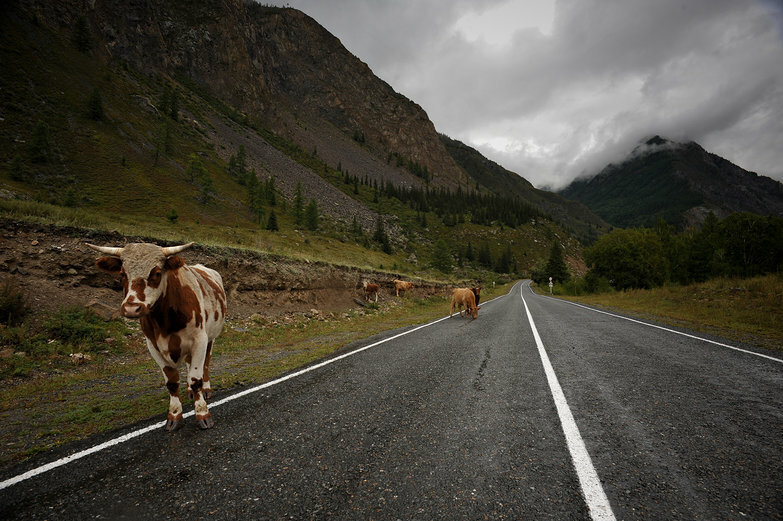 With each kilometer we drive, towns, villages, and shops become more and more sparse, and soon we are passing through long stretches of what feels like wild land, unpopulated save for the cows who have taken up residence in the middle of the road. We inch towards them and honk, and they reluctantly give us enough room to go around them. When we eventually reach a gas station, it is nothing like the brightly colored, well signed establishments we've grown used to. It is a minuscule, unassuming, unmarked building flanked by a couple of rusty pumps. We decide it is time to fill up our jerry can. While we've had little need of it so far, we don't want to take any chances in Mongolia. Tyler fills the can, and realizes to our dismay, that the cap is broken. 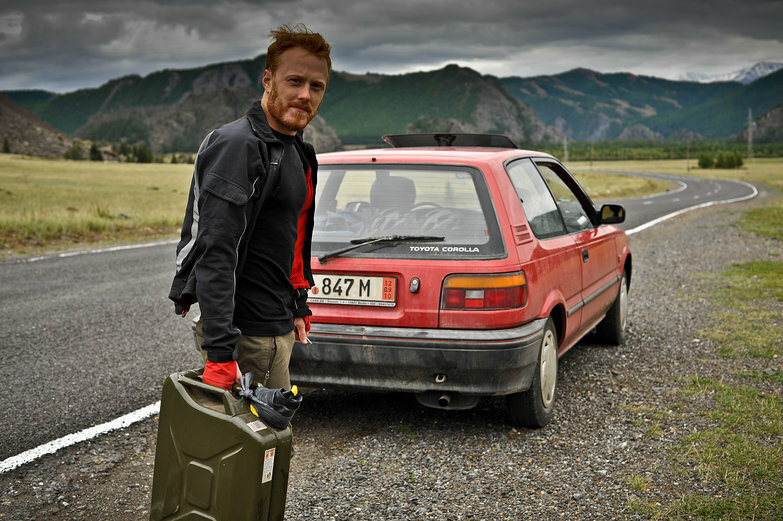 He opens the trunk, removes one of our spare bicycle tires and sacrifices it to seal the now heavy container of petrol. Once we're prepared with benzine, I start scouting for places to stock up on food. We have quite a lot already, but I will feel better if we have a bit more. When I see a small wooden building with a sign that says magazin, I tell Tyler to pull over. We should probably stock up on food; who knows when we'll come across the next shop? Tyler stays in the LRC, while I open the thin door with a long, high-pitched creak. 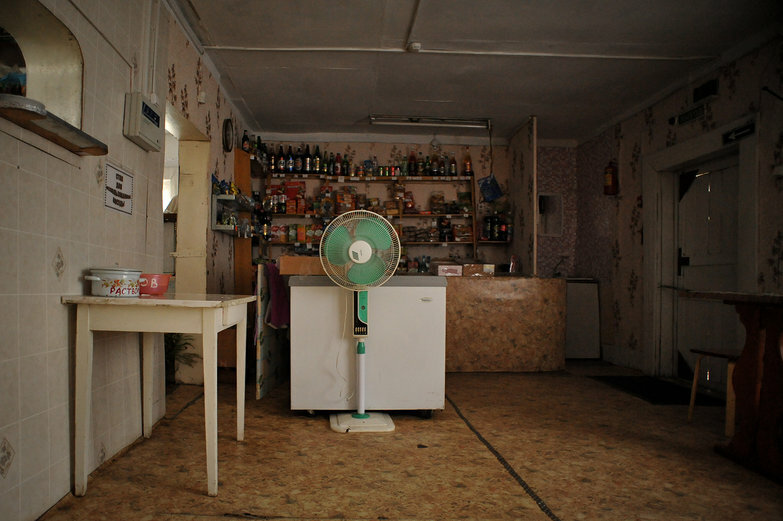 Inside, unlike any other small Russian shop we've been to, there is a small cafe. Several people are already sitting at the tables and chairs, wrapping their cold fingers around hot cups of chai and tucking in to steaming bowls of soup and hearty dishes served with freshly mashed potatoes. Confusing the woman who greets me with a blank, expressionless face, I immediately turn around and exit the little glowing haven and head back into the cold, dark outdoors. Running back to the car, I tell Tyler to come with me. We're having lunch here. Now the two of us enter the tiny cafe together, and the savory smells once again surround us. Bread is baking in the back room. In a remarkable display of Russian language skills (I guess its finally sinking in? 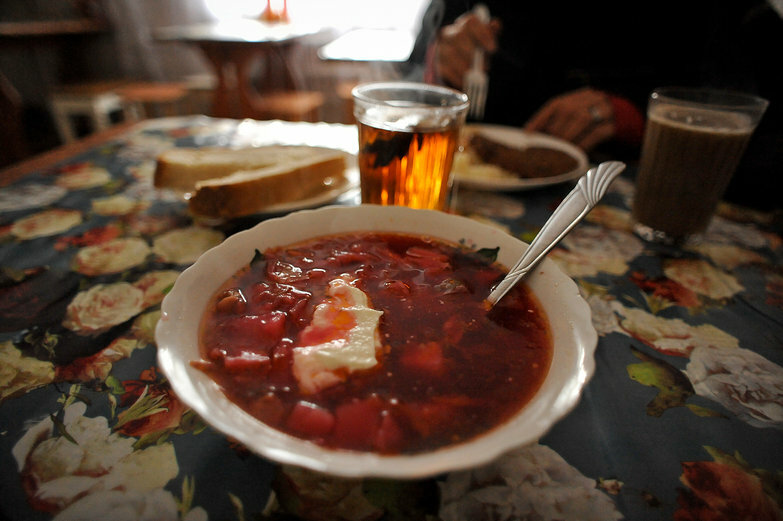 ), we order borscht and chai and a plate of meat and mashed potatoes. An entire loaf of freshly baked bread will accompany our lunch, and serve as our breakfast in the morning as well. The hearty meal costs mere dollars, and we find ourselves wishing we had eaten out more in Russia. Our food is ready before we know it – woman in the kitchen hands the plates through an opening in the wall and sets them on a counter for us. I go over and pick them up as they come through, then set them on the table. Lunch is served. My borscht it hot and homemade and delicious with the clean, strong flavors of fresh vegetables and seasonings. Tyler's mashed potatoes are real of course, what else would they be in the Russian Altay? Over our meal, we talk to the other people at the cafe. Most of the customers have left by now, but the two women who run the restaurant take a break and sit down to their own meal at a table by the window. When the door creaks open once more, revealing a hungry truck driver coming in from the cold, one of the women stands up to serve him. Thus, we begin talking with the driver and the two women. They ask us where we are from and almost drop their forks when we explain where we've come from. Conversation leads on, and and they ask us about our trip. 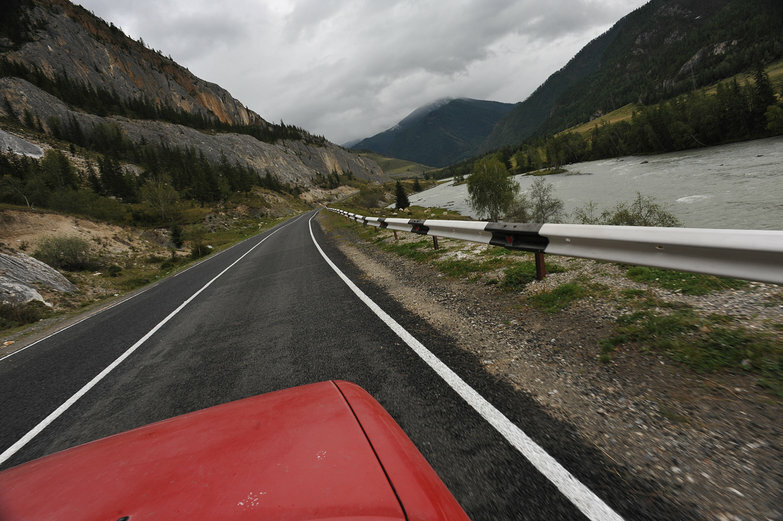 Miming ensues, of course, and soon we are receiving valued advice about intended destination of Mongolia from the driver. The roads are crap, he seems to say; Stick to 40 kilometers per hour, and you'll be okay. Meanwhile the women are concerned about us. I hope you have warm clothing, one of them clucks to us motheringly. It is cold in Mongolia. We thank them and assure them we'll be okay, slightly cheered by the fact that they take our entrance into the country as a given, and not as an unknown. With warm handshakes all around, we ask to take their photographs before leaving. 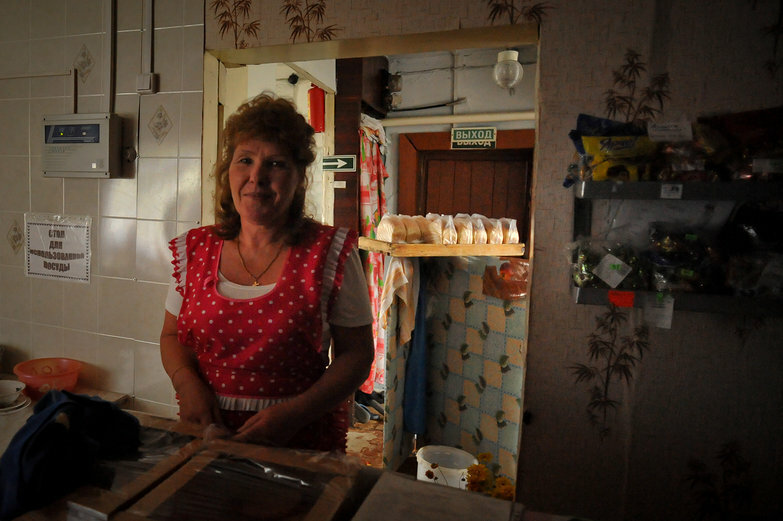 The proprietress has warmed up to me a little by now, giving me a slight smile as she allows me to take her photo. The truck driver proudly leaves the cafe with us, and poses in front of his truck. With a final, firm handshake, we say goodbye and he wishes us luck as we drive ever closer to Mongolia. Back in the car, we are done with the silence we enjoyed earlier in the day. I slip a cassette into our tape deck and plug my iPod into the long cord that strings from it. Around and around I move my thumb until the highlighted screen lands on something appropriate for the mood of the day and the landscape around us. When the chilling, mesmerizing voice of Loreena McKennett sounds over the stereo, Tyler turns to me and smiles. Good choice, he says. Now we have just the right soundtrack for our breathtaking ride. Now listening to "Incantation" and other songs that hearken our imaginations back to other times and ancient voyages, we immerse ourselves in this experience, perhaps more than we've ever done on our trip. 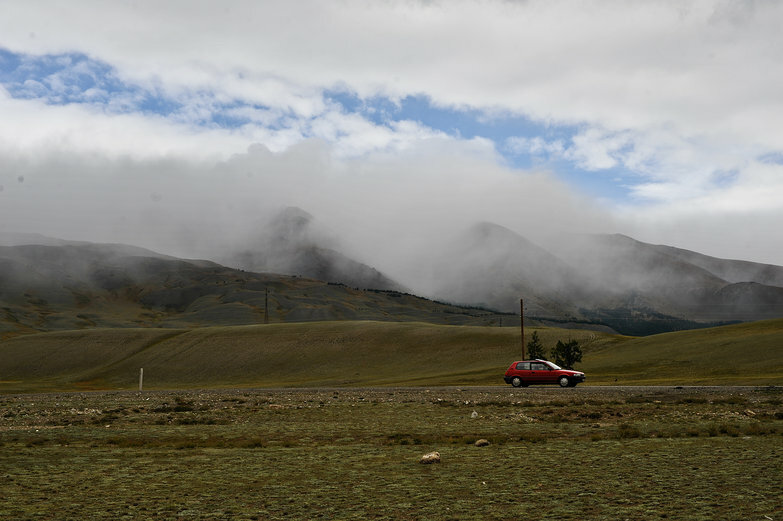 Right now, approaching Mongolia, our trip somehow feels monumentally epic, and yet we are so small, our car just a speck in the mountains that surround us. 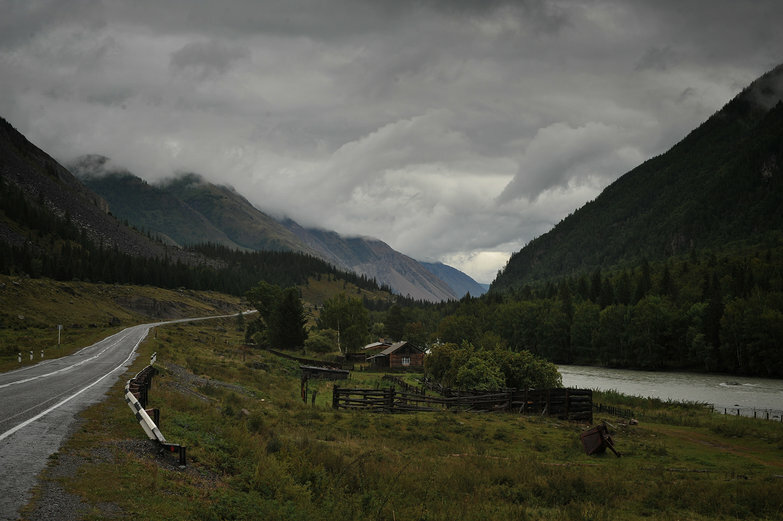 Mist descends, the skies turn even darker, and a bitter wind whips through the mountains as we travel onwards, ever further towards the edge. I don't mean to add to your workload or anything, but have you two considered posting a shop and selling some of your photography? 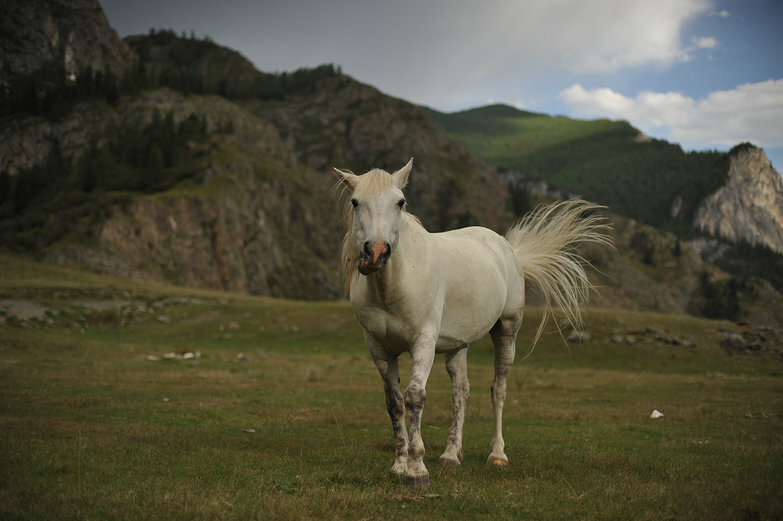 That horse photo is beautiful. I've been working my way through the archives, and I also love the photos you take of doors. I was considering asking you for the large-size digital files for a few of them so I could hang them in my house! Indeed a perfect choice of music to accompany the beautiful, mystical setting.